Learn the holistic or naturopathic perspective of disease, causes and stages of disease. Learn the practice of correcting and balancing the internal cellular environment thru detoxification and various other methods. Learn a variety of detoxification protocols. The student will learn how to use essential oils and herbal remedies safely. Ailments of the Digestive system, Circulatory system and Respiratory system will be discussed. The student will learn how to use the electromagnetic power of the body, and how to use Homeopathic remedies for acute and chronic ailments. Ailments of the Nervous system, Reproductive system and Urinary system will be discussed. The student will learn how to interpret the appearance of the tongue in relation to various organs and how to feel for the pulse to determine the status of the clients health. 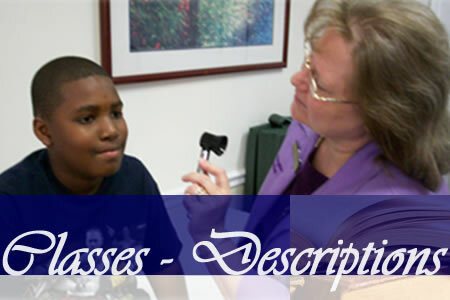 The student will interview the client, perform observations, make recommendations and test remedies. Symptom documentation and natural remedy selection. Evaluation of the meridian and energy systems. Iris, tongue, pulse, hara (abdominal energy), muscle trigger point and pH evaluations. Performance of ten naturopathic exams and reports. Each participant will receive more practical learning experience in Face, Pulse, Hara and Tongue study. These observations will enable the practitioner to determine which energy and organ systems are out of balance. Analyze case studies and client volunteers with a naturopathic doctor. Learn how to use a digital camera and laptop to use in your practice. Participant will have hands-on experience working with client volunteers while supervised by a naturopathic doctor. This level includes nail analysis. Each participant will receive a comprehensive review of homeopathic products usually recommended by Naturopaths. Pros and cons of product inventory, web purchases, vitamin stores, etc. System Affinity/Terminology: Study of history and philosophy of Western Herbal medicine, medical, herbal and botanical terminology. System affinity of herbs. Detoxification: In-depth study of detoxification to rid the body of pollutants, Candida albicans and parasites. System affinity of herbs continued. Pressure application by the hands and fingers. Acupressure methods and the balance of the flow of energy in the body. Anatomy, physiology and medical terminology as related to each meridian. Each participant will be able to practice using aromatherapy with acupressure for physical issues, relieving stress and emotional healing. Client volunteers will work with participants while supervised by a naturopathic doctor. The focus of this workshop is developing the practitioners’ skill in finding acupressure points and determining the best essential oil to use for each ailment. How the components of foods compliment the use of other natural health care modalities. Benefits to food when assisting the client in promoting optimum health. Nutritional information that compliments the use of herbs when caring for clients. Benefits of various vitamins, supplements and mineral in health care. Supplementation to the diet promoting faster healing for the client. This course will teach the proper procedures of the CLIA (Clinical Laboratory Improvement Amendment) waived laboratory tests approved by the Federal Government. Upon completion of this course the practitioner will be able to use test kits to determine the presence of various substances in the client’s system, such as glucose, cholesterol, ph balance, protein, leukocytes and ketones. This course is an advanced level of laboratory testing that will teach the proper procedures of the CLIA (Clinical Laboratory Improvement Amendment) waived laboratory tests approved by the Federal Government. Under the CLIA certificate of Waiver the Lab technician is permitted to collect specimens that can be sent out to laboratories for advanced specialty testing. The course will also include the proper collection of these specimens and information about tests that can be sent out. Promoting positive thought in the client. Understanding the client psychological outlook. Basic techniques in communication, relaxation, guided imagery and visualization. isualization and other Mind/Body Medicine techniques are useful in helping the practitioner assist the client to change habits, relieve panic attacks, phobias and relieve stress. Each participant will be able to practice more visualization techniques. Client volunteers will work with participants while supervised by a naturopathic doctor. The objective of this course is to exposes the students to the theories, ideas and principles of Natural Health and Holism as utilized in the practice of Natural Medicine. At the conclusion of this course the student will be able to iterate the basic fundamentals of natural health philosophy and utilize holistic philosophy in their life as a guide.